Ask fellow campers about "Williamson's Lake Campground" and nearby attractions. We were looking for a place in Revelstoke that would be convenient to town and Revelstoke NP. We're self-contained and don't use the facilities except for an occasional shower. We stayed on a weeknight in late August in our 8 metre (25 foot) MH. This is a nice, clean small CG very close to town. The staff is friendly and very helpful. The CG is well maintained. The sites are relatively small and close together, separated by wooden fences and plants for a bit of privacy. Most are gravel and may need some leveling. Those closest to the lake are in full sun while those away from the lake and the pull thru sites in the center have trees for shade. A few RV sites have views of the lake. Sites on the lake are for tents only. There's a variety of types of sites, elec only, full hook up, etc. There's a dump station with potable water near the entrance. The shower was clean with ample hot water and water pressure. There's good ATT cell service while roaming on Rogers and good Verizon while roaming on Telus. We camped at Williamson's Lake Campground in a Motorhome. The CG itself has many activities - mini golf, canoe, paddle board pedal boat rentals, swimming. Downtown Revelstoke is 5k (3mi) from the CG and has shopping and restaurants. Mount Revelstoke National Park is across town and features the drive to the summit - Meadows in the Sky Parkway. With the ongoing forest fires in the area all fire rings have been removed from the sites. 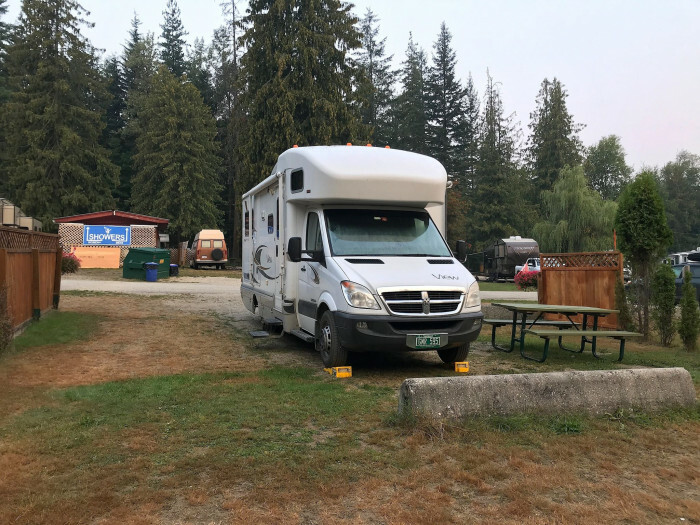 This campground is one ofour favourite stops when we get to B.C. Sites are dirt with some grass and are not raked in between guests. The park is owned by the city but contacted to a private company to manage it. The park offers canoe and paddle board rentals. The wifi is available near the office only. I would recommend sites 46 or 47 which are back-in sites that are electric only but offer the best view of the lake. We camped at Williamson's Lake Campground in a Fifth Wheel. Our stay was in October, no families or children, weather was cool. Grounds seemed very clean, grass was cut and place was quiet. Can see the value for families. Place is still managed out of a trailer. We camped at Williamson's Lake Campground in a Fifth Wheel. One of the last places still open for camping so late in the season. Advertised closing date was 15 October. Water had not been turned off as of yet even though it went below freezing during the nite. Certainly well away from highway and railroad traffic/noise (definitely a bonus). Would, if travelling through during summer season, try this place again. We were here three years ago, and it has not gotten any better. Small RV and tent park situated at a local lake attraction. Great for families and party groups, with swimming, putt-putt, play areas, boat rentals, paddle boards, fishing, etc. Don't come if you don't care about those and want to get to sleep at a reasonable hour. My rating is for the physical amenities alone; it wouldn't be fair to give it a 3 or 4 because I don't have kids and want a quiet campsite. Now the park - some pull-throughs, some back-ins, and many tent sites. All are dirt, gravel, or grass, some shaded, some in the open. Site amenities vary; some have full service, others lack sewers, TV, or electricity. My sewer connection was higher than my outlet (the dump station on the way out is excellent). Interior roads are all gravel. While the location is suitably far from highways and railroads, and still near town, locals can overwhelm the lakeside areas and fill the roadsides with parking. Bathrooms are so-so, only cold water is available. Cell reception is good, but WiFi is terrible or non-existent except near the office. We camped at Williamson's Lake Campground in a Travel Trailer. An older park. Some construction work going on putting in a new office area. Running the office out of a travel trailer at the moment. It was dusty during our stay caused by the hot dry weather. A good place for a night or two for sure. We camped at Williamson's Lake Campground in a Fifth Wheel. The campground is now under new management and she is working hard to freshen and update the facilities. A new snack bar and patio are under construction. As others have mentioned, the park sets alongside a lake, but the sites are not on the water. The campground offers sites with full hookups, electric only, and no hookups. 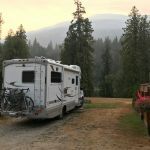 We had a nice, level pull-through site with plenty of room for our 4-slide, 40' RV and tow. We would definitely return to stay longer and rent a canoe! We camped at Williamson's Lake Campground in a Motorhome. Our favourite choice when in the Revelstoke area. Quiet and well maintained at the cheapest price in the area. We are always made to feel welcome. We camped at Williamson's Lake Campground in a Motorhome. Big sized pull through site. Central to activities in Revelstoke area. Friendly staff, very open and lots of room to spread out, will return. 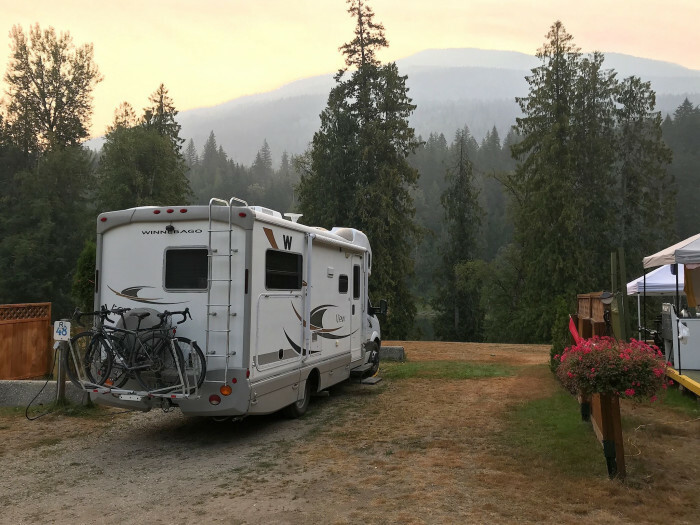 We camped at Williamson's Lake Campground in a Fifth Wheel. This municipal campground is a mixed bag. It has a lot of potential, but is not quite there. It is one of the more reasonably priced campgrounds in the area, so is fairly heavily used. It is fairly convenient to town. There are dry camping sites, sites with electricity, and full-hookup sites. If in a dry site, you are only allowed to run your generator for an hour in the morning and an hour in the evening. The price shown is for an electric service site. There is fresh water fill and a dump station, which costs an addition $3.00 per use. None of the sites are actually on the lake, but it is close by. The sites are fairly well separated, but there is not a lot of vegetation to provide privacy. We chose an electric site that was fairly nice; however, when we plugged in our electrical management system would not allow it to come on and reported that the plug had reverse polarity. A test with a meter confirmed the problem. We were moved to a site that was full-hookup, but not nearly as nice. There the electricity was OK, but our view was of a large white storage container. We elected to stay only one night. We observed that the park manager had put someone into the site we had rejected and had not corrected the problem. Our Verizon phone worked well. We could not get satellite because of trees. We would probably not stay at this campground again. We camped at Williamson's Lake Campground in a Motorhome. If you want a quiet campground, this isn't it. If you are looking for family spots, this is a kid-centric park, and they are everywhere. There is miniature golf, swimming, paddle boats, and a large playground. The lake is open to locals, so they fill the parking lot and line up down the road. Sites are closely-spaced, gravel, off-level side-to-side by several inches, and served by a mostly gravel loop road. Some grass and tables near sites, lots of grass elsewhere in park. There are many tent sites crammed in everywhere. Some sites have shade, most do not. Bathrooms are so-so, one has only cold water. Management is friendly and helpful. There is a small store and short-order kitchen attached to the office. Cell service is good, but Wi-Fi is only available in about half the park. Cable TV includes a couple of US stations. We camped at Williamson's Lake Campground in a Travel Trailer. Friendly, helpful staff. Clean washrooms and free showers. NOT near the railway or Transcanada so very quiet right now, but it's not a weekend or summer vacation. We camped at Williamson's Lake Campground in a Motorhome. Fairly nice setting. Sites available on the lakefront or closer to the showers on the hill. Fast Wifi connection and clean sites. Away from much of the highway and rail noise Revelstoke is famous for. Friendly staff. A preferable over night stop at most. We camped here in a truck camper. We camped at Williamson's Lake Campground in a Truck Camper. 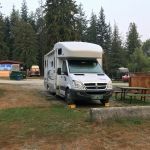 This campground is small, friendly, accessible, clean, and well away from the highway and railway noise. Some sites are shaded, but others are open, allowing for good satellite system access. The rates are very reasonable. Overall this was a very nice campground. We will definitely stay here again. We camped at Williamson's Lake Campground in a Fifth Wheel. One of the last places still open for camping so late in the season. Advertised closing date was 15 October. Water had not been turned off as of yet even though it went below freezing during the nite. Certainly well away from highway and railroad traffic/noise (definitely a bonus). Would, if travelling through during summer season, try this place again. Are you affiliated with Williamson's Lake Campground ?